With the release of Interstellar in 2014, Christopher and Jonathan Nolan, two of the preeminent film-makers of our time, used adept practical effects and set-pieces, stunning cinematography, and compelling screenwriting to tell an allegorical epic on a galactic scale that transmits what I believe are timely universal messages for contemporary American culture. Set in a not-so-distant future where few major technological advances beyond our current capabilities have been realized, Interstellar‘s setting provides the audience with easily recognizable and familiar vehicles, electronics, and places. When exactly the film takes place, though unspecified, can be inferred through John Lithgow’s character Donald, who is introduced as the father-in-law of a 40s-something year old widowed Cooper (played by Matthew McConaughey) and grandfather to 10 year old Murph and 15 year old Tom. The population of the Earth was 6 billion people around the year 2000, so 70 year old Donald is likely a Millennial (Generation Y, born in the 1980s and 90s). Set roughly 50 years from the film’s 2014 release, “this world” to which Donald refers has been plagued for decades by the worldwide depletion of food resources caused by blight, the name given to a soil disease that has, by the start of the film, decimated crops, including wheat and okra to the point of extinction. Corn is the sole remaining source of sustenance for a dwindling human population. Without a surplus of food, societal advancements plateaued and the world’s military powers fell into conflict over scarce resources. In contrast to Donald’s upbringing of limitless potential, it was war over limited food supplies and diminishing expectations that defined Cooper’s childhood. Around the time Cooper’s daughter, Murph, is born, however, military efforts along with many other functions of government ceased in favor of investing in farming – forcing Matthew McConaughey’s character to stop his pilot training and abandon his engineering aspirations to pursue a more “socially responsible” career as a farmer. The opening scenes of the film establish the daily routines of Cooper and his family living on a traditional agricultural homestead in a small town somewhere in the Midwestern United States prairie lands – perhaps Kansas. Despite contending with frequent dust-storms reminiscent of the American dust-bowl in the 1930s, and State-run schools geared towards churning out farmers rather than critical thinkers similar to how the public school system produced factory workers around the turn of the 20th century in urban America, Cooper manages to put his engineering background to use by automating the farming operations on his property. This frees up Cooper’s schedule and provides him with both the opportunity and the example with which to instill in his daughter, Murph, an interest in science and a desire to strive for something beyond what currently defines her life. It is within this hope-starved, pessimistic dystopian setting that Interstellar tells its allegorical story. Allegory is an ancient storytelling device used for millennia to convey complex ideas, messages, and concepts through archetypal and representative characters and events. I believe that the Nolan brothers’ aptly employ allegorical storytelling into the narrative of their 2014 science fiction blockbuster. 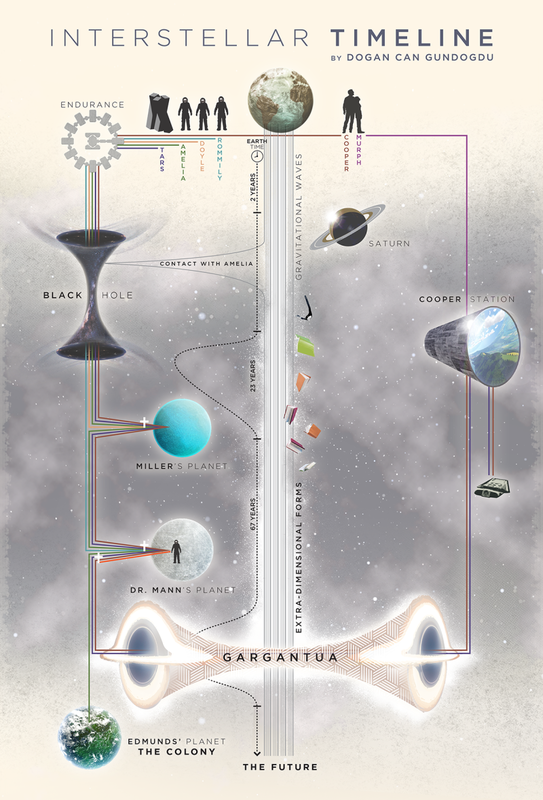 More than just providing the motives, tendencies, rationales, and reconciliations for the main characters introduced in the film, each event playing out in Interstellar‘s surface plot simultaneously tells another and much grander story about humanity. In the film’s first act, three unusual events conspire to transform Cooper’s mundane routine – characterized by programming farming equipment, going to parent-teacher conferences, chatting with Donald on the porch over beers, and attending touring exhibition sporting events – into an extraordinary adventure. First, en route to his children’s school Cooper gets a flat tire, which compels Tom to blame Murphy’s Law and poke fun at his little sister’s name. While patching the flat, Murph asks her father why she was named for something negative to which Cooper responds that Murphy’s Law doesn’t mean “whatever can go wrong, will go wrong”, but rather that “whatever can happen, will happen” – a distinction that Cooper hopes will teach his daughter to expand her own potential. Right at the moment an important message is being relayed to Murph, a large flying object swoops overhead – leading Cooper to rush the family back in the truck to chase what the trained pilot exclaims to be a malfunctioning Indian surveillance drone. Rationalizing the event as a result of the drone “flying too close to the sun” and frying its circuits thus giving him the opportunity to pursue, remotely hot-wire, and retrieve it, Cooper – in an act of social responsibility – later re-purposes parts from the drone including its solar panels to use in the tractors on his farm. While the occurrence certainly functions to better establish the near-future setting for the film and highlight Cooper’s industriousness, I believe the drone represents something more. This is a messenger sent from above. In the Abrahamic religious tradition, the drone might be a heavenly being, an angel, sent by God to communicate a divine lesson to mankind. To the ancient Egyptians, this would have been represented in mythology by Thoth; to the Greeks, the drone was Hermes, or a prophetic muse. A more modern representation of this story element is the ghosts from A Christmas Carol (1843) by Charles Dickens. Like Scrooge, the audience has a message to heed and in a way, Cooper’s initial interpretation, although he meant it quite literally, is perhaps correct. Unfortunately, an uninitiated Cooper is wholly unprepared at this point in his journey to receive any lesson, let alone perceive the messenger or its sender for what they are. Second, Donald calls Cooper back to the farm one afternoon because the automated tractors have gone “haywire”. When he arrives at the house, the combines aren’t out in the fields tending to Cooper’s corn crops, but rather are idling near the front porch. After resetting the GPS systems, Cooper sends the farming equipment back out into the fields – revealing to Donald that he needed to reprogram each unit to account for an unknown “anomaly” interfering with the tractors’ default settings and causing them to veer off course. With the immediate concern resolved, Cooper leaves answering the larger questions surrounding him for another time. Third, in several early scenes Murph makes reference to a “ghost” in her bedroom that knocks books to the ground, pushes items off her shelves, and seemingly interacts with her in mysterious ways. Murph, a curious and open-minded child, is convinced this unknown being is trying to communicate with her. An incredulous Cooper, on the other hand, encourages her to apply sound logic and scientific reasoning to her experience. Tom, as the quintessential older brother, mocks his younger sister’s perceived delusions. During one of the dust storms when Murph forgets to close her bedroom window and Cooper races upstairs to prevent more debris from entering the house, however, the “ghost” reveals itself in the initially inexplicable pattern the falling dirt creates on the bedroom floor. Not easily ignored, this third phenomenon prompts Cooper to consider its meaning more thoughtfully. After careful study, an ever rational Cooper declares the dust pattern not to be the result of a “ghost” but of “gravity”, perhaps the same force affecting his tractors’ GPS systems, sending the surveillance drone down, and causing “the crash” during his pilot training (shown as a dream in the film’s opening scene). Far from a divine warning, in Cooper’s calculation gravity’s message merely consists of coordinates to a location within a day’s driving distance of the family’s home. Following the longitude and latitude bestowed to him by the gravitational anomaly, Cooper eventually arrives at a “NO TRESPASSING” sign hanging on a tall barbed wire fence surrounding a remote facility. While attempting to break through the chain link enclosure with bolt cutters as Murph sleeps in the passenger seat of the truck, flood lights suddenly pour over the entrance area as a booming synthetic voice reprimands Cooper for his intended transgression. Vulnerable and completely out of his element, Cooper awakens handcuffed to a metal table and chair with a large robot interrogating him. Plunged into the unknown, Cooper’s immediate concerns about his whereabouts and the well-being of Murph are somewhat alleviated when he recognizes the name of a young woman who enters the room, identifies herself as Dr. Amelia Brand (Anne Hathaway), and assures the worrying father of his daughter’s safety. Cooper is then escorted to a boardroom occupied by half a dozen or so well-dressed professional-looking people sitting with Murph. Cooper sees a familiar face at the table – Amelia’s father, the Dr. Brand (Michael Cane) that Cooper previously worked with during his pilot training. The coordinates have led Cooper to the secluded headquarters of NASA – his former employer – now forced to operate in secret due to the government’s immensely reduced size and societal role in the wake of global conflicts over food resources leading to prioritizing terrestrial survival above cosmic aspirations. The scientists are perplexed as to how Cooper found their well-hidden facility until he mentions the “anomaly”, which NASA detected and has been studying independently ever since a wormhole to another galaxy appeared near Saturn decades earlier. Dr. Brand also reveals to Cooper that additional research by NASA at the facility concluded that blight will soon destroy corn crops, the last remaining reliable source of sustenance for the planet. Dr. Brand: We’re not meant to save the world. We’re meant to leave it. Cooper: Sure, but he had to die in the first place. There’s not a planet in our solar system that can sustain life and the nearest star is over a thousand years away, I mean, that doesn’t even qualify as futile. Where’d you send them? Dr. Brand: Cooper, I can’t tell you any more, unless you agree to pilot this craft. You’re the best pilot we ever had. Cooper: What, without even knowing it? An hour ago, you didn’t even know I was alive and you were going anyway. Dr. Brand: We had no choice. But something sent you here. Dr. Brand: Get out there, and save them. We must reach far beyond our own lifespans. We must think not as individuals but as a species. We must confront the reality of interstellar travel. Cooper was fatefully delivered to the facility just in time for the launch of NASA’s final space expedition – the mission for which he was unknowingly trained years earlier, but never completed due to the crash, global wars, and familial responsibilities brought upon by the death of his wife. Cooper is propositioned with a key component of NASA’s plan to save mankind from the dying Earth – piloting the Endurance, a dodecagonal space craft. In the plan, a group of NASA scientists is tasked with venturing through the wormhole to another galaxy where they must choose a habitable world and retrieve the crew member from three of the twelve planets previously explored by the Lazarus expedition, while Dr. Brand figures out how to transport space stations filled with Earth’s remaining population to Saturn’s wormhole where it can be directed to the new home planet. That is Plan A. If Dr. Brand cannot solve the physics of transporting a space station across the solar system then the alternative, Plan B, is for the Endurance scientists to colonize and seed a habitable planet with a bank of human embryos they will bring with them. Filled with a sense of duty to mankind, a desire to use his skills, and a responsibility to his children’s future, Cooper accepts the mission and in so doing makes the heartbreaking decision to leave his family on Earth in the hopes that he will be able to save them from impending doom. Back at the homestead and despite having no idea when or if he will ever come back, Cooper, the optimistically stalwart father, promises Murph that he will return to her as he hands his wristwatch over as a memento in a gut-wrenching and abrupt farewell scene. In the process of her father leaving, books are somehow flying off her shelves seemingly on their own, which Murph interprets as her “ghost” trying to prevent Cooper from going. Murph’s pleas aren’t enough, however, and Cooper departs towards Saturn along with Amelia, two other NASA scientists, Doyle and Romilly, and a robot, TARS. In one of many beautiful cinematic shots to come, the Endurance crew approaches the perfectly spherical wormhole near Saturn catching glimpses of the new galaxy beyond before entering and transporting to the other side. The crew emerges from the other end of the wormhole within reach of three potentially habitable worlds located in the same solar system named for the members of the Lazarus mission that inhabit them: Miller, Mann, and Edmunds. With just enough fuel, resources, and supplies to allow the Endurance crew to visit each of the three potential new worlds within this system and return back through the wormhole to Earth, Cooper and his colleagues choose to begin their venture at Miller’s Planet, which along with Mann’s Planet are orbiting Gargantua, a black hole formed from a collapsed star. Due to its proximity to Gargantua, Miller’s planet is substantially impacted by gravitational time dilation – causing time to run much slower relative to places outside of the planet’s orbit. Every hour on Miller’s surface, is 7 years on Earth. A constant stream of data being transmitted from the planet’s surface, however, seems promising. There is liquid water, organics, and an atmosphere. Cooper docks the Endurance just outside of Gargantua’s gravitational pull and while this consumes additional fuel, it conserves time – Cooper’s most precious resource for returning to Murph. Romilly remains on the ship to relay data about the black hole to aid Dr. Brand in his calculations. Meanwhile, the rest of the crew ascends to Miller’s surface. The sight of white clouds, mountain ranges on the horizon, and a vast blue ocean are a hopeful sign for Cooper, Amelia, and Doyle as they explore the area around their landing point. Their optimism, however, is quickly crushed as they discover punishing surface gravity, wreckage from Miller’s ship, and what they initially thought were distance mountains are in fact a continuous cycle of massive tidal waves. Rushing back to the ship as a wave approaches, Doyle – the last to board – is dragged into the water and the crew’s air craft is swept up along the break of the enormous wave. Crashing back to the surface on the other side of the swell, Cooper, Amelia, and the robot are stuck on the planet with engines flooded and time ticking. As another wave approaches, Cooper is forced to use fuel to blow air through the engines and exhaust them so that the craft can take off just as the tide begins rising again. Arriving back on the Endurance a stoic Romilly, noticeably older, greets the remaining crew and reveals that although they hadn’t aged more than a few hours since they left, Cooper and Amelia had been gone for 23 years relative to Earth. Devastated, the two crew members rush to view logged video transmissions from their families. Dr. Brand has steadily updated his daughter about his progress on the calculation and Cooper’s son, Tom, sent a stream of videos chronicling his graduation from high school, marriage, childbirths, and the deaths of Donald from natural causes and one of Tom’s sons from chronic dust inhalation. According to the now grown Tom (played by Casey Affleck), Murph (Jessica Chastain) has been working with Dr. Brand trying to solve Plan A’s physics problem, but not until her birthday when she turns the same age as Cooper when he left does she spitefully record a message for her father. Fully submerged into uncontrollable chaos, time has escaped a weeping Cooper. Miller hadn’t been consistently sending out a stream of encouraging data. The deceptive signal emanating from the planet’s watery surface was merely the initial reading repeating endlessly out into the cosmos – like a Siren. In Amelia’s determination, Miller’s Planet orbited too closely to Gargantua and in flying too near a collapsed star to benefit from life-inducing phenomena, the world remains uninhabitable. With only enough fuel and supplies to make it to either Mann’s or Edmunds’ planet while accounting for a return trip to Earth, the Endurance crew is faced with a difficult choice and in the process of deciding, a secret held by Amelia is revealed. Amelia: He’s remarkable. We’re only here because of him. Amelia: Granted. But Edmunds’ data is more promising. Amelia: Well, if we’re going to vote, there’s something you should know. Brand, he has a right to know. Amelia: That has nothing to do with it. Amelia: Yes. And that makes me want to follow my heart. But maybe we’ve spent too long trying to figure all this out with theory. Amelia: So listen to me, when I say that love isn’t something we invented, it’s observable, powerful. It has to mean something. Amelia: We love people who have died, where’s the social utility in that? Amelia: But maybe it means something more, something we can’t yet understand. Maybe it’s some evidence, some artifact of a higher dimension that we can’t consciously perceive. I’m drawn across the universe to someone I haven’t seen in a decade. Who, I know, is probably dead. Love is the one thing we’re capable of perceiving that transcends dimensions of time and space. Maybe we should trust that, even if we can’t understand it yet. Amelia: Alright, Cooper. Yes! The tiniest possibility of seeing Wolf again excites me. But that doesn’t mean I’m wrong. For me, Amelia’s speech about the transcendence of love is the weakest moment in the film. Its clunky writing reveals a shortcoming for Jonathan Nolan, Anne Hathaway’s delivery leaves much to be desired, and the speech feels too expository for what is otherwise a story told through allegory. The message, however, is familiar, moving, and convincing if not because of Nolan’s writing, then because this message permeates our culture’s literature, works of art, and use of language. With Amelia’s speech, I believe Nolan attempted to capture an idea, which was perhaps already perfected in another great work that shares Nolan’s intentions. Mann’s Planet, like Miller’s and Edmunds’ shows promising data, but upon ascending into the atmosphere of the planet, the world reveals frozen clouds, an icy terrain, and a stark landscape. After being woken up, Dr. Mann (Matt Damon) assures the crew that below this brutal landscape is a surface populated by organics, a breathable atmosphere, and possibly even other life forms. Meanwhile, back on Earth a dying Dr. Brand reveals to Murph on his death bed that he solved the physics equation long ago and that it was impossible to transport space stations off the planet without a better understanding of gravity. Plan A had been a lie. Murph immediately transmits a message to Amelia notifying her of her father’s passing followed by accusations that Cooper knew of Dr. Brand’s lie and he had knowingly abandoned her. Watching the video from Mann’s base, the Endurance crew – with Mann looking on – are astounded by Murph’s accusation. Mann assures them, however, that she is correct and that the architects of the mission were aware that Plan A would not work and consciously used it as a recruiting tool to get people like Cooper, Murph, and the others to participate. Motivated now more than ever to return home, Cooper attempts to hurry the colonizing effort along so that he may travel back to Earth while Mann’s planet is prepared for seeding. Mann: Your father had to find another way to save the human race from extinction. Plan B. A colony. Amelia: But why not tell people? Why keep building those damn stations? Mann: Because he knew how hard it would be to get people to work together to save the species instead of themselves. Mann: You never would have come here unless you believed you were going to save them. Evolution has yet to transcend that simple barrier. We can care deeply – selflessly – about those we know, but that empathy rarely extends beyond our line of sight. Mann: I’m sorry Cooper. Their case… is hopeless. Mann: We are the future. Mann and Cooper head down to the planet’s surface to set up an outpost. Along the way Cooper discovers that in traveling to Mann’s Planet and waking him from cryosleep, Lazarus may not have been the one who was awoken or raised from the dead. Dr. Mann: You know why we couldn’t just send machines on these missions, don’t you, Cooper? A machine doesn’t improvise well, because you can’t program the fear of death. Our survival instinct is our single greatest source of inspiration. Take you for example; father, with a survival instinct that extends to your kids. What does research tell us is the last thing you’re gonna see before you die? Your children. Their faces. At the moment of death, your mind is gonna push a little bit harder to survive. For them. Dr. Mann: I’m sorry, I can’t let you leave with that ship. We’re gonna need it to complete the mission. Once the others realize what this place isn’t, we cannot survive here! I’m sorry! I’m sorry! Dr. Mann: Don’t judge me, Cooper. You were never tested like I was. Few men have been. You’re feeling it, aren’t you? The survival instinct. That’s what drove me. It’s what drives all of us, and it’s what’s gonna save us. Because I want to save all of us. For you, Cooper. After abandoning Cooper, Dr. Mann returns to base camp to retrieve his ship so that he may take control of the Endurance and complete the Plan B mission on Edmund’s planet – leaving Cooper and the rest of the crew to die. Cooper had been deceived by a temptation that NASA’s remarkable leader, the “best of us”, now a Fallen Angel, had attempted to resist for years. In the film, Christopher Nolan brilliantly inter-cuts the reveal of Mann’s fall with scenes on Earth of Murph trying to convince her stubborn brother to leave the family’s farm, which is a source of illness for Tom, his wife, and one surviving child. Murph’s pleas with her brother, however, are rejected. While Cooper gasps for air on Mann’s godforsaken planet, his daughter retreats from her childhood home in frustration. As Cooper’s prospects fade to black with each starved breath, any hope for his family’s future along with the rest of Earth’s population is consumed in darkness. In addition to heightening the tension of the story’s climactic moment to come, and drawing a parallel between Dr. Brand and Dr. Mann’s shared macro-amorality through inter-cutting these two scenes, the film’s editor also contrasts the ideologies embodied by Mann and Cooper’s son. In Nolan’s epic, the Fallen Angel, as illustrated by Dr. Mann, is so preoccupied with being seen as the heroic figure who saves the day within his own lifetime that he is willing to do anything to achieve his desired goal, including enticing his own rescue through deception, marooning his rescuers in space, and murdering a colleague. Formerly the brightest star leading the way, Mann fell from grace – resorting to falsifying data to trick any would-be saviors into picking the forbidden fruit and joining Mann in his barren Hell. By only looking into the distant future, to existential crises, Mann and Dr. Brand skirt their responsibilities to the current generation of life. Conversely, The Farmer, exemplified by Casey Affleck’s character, Tom, represents a human tendency to be overly fixated with immediate local concerns to the point of ignoring larger challenges. Traditionally, farming has been a noble and necessary lifestyle. It allowed civilization to emerge from the caves and for civil society to flourish in cities surrounded by agricultural hinterlands. In the film, however, Tom inherits his father’s farm and continues his operation unchanged despite the clear evidence of the worsening condition of the world around him like the untimely death of his first son due to respiratory sickness and the decreasing yields of his corn crops. The farmers in the movie epitomize a contentedness with caring for the world into which one is born rather than striving towards something greater. Farmers showcase our collective ability to blind ourselves by sticking our heads in the dirt and denying our reality, our place in the cosmos. In the darkest moment, when all hope is nearly lost as Cooper struggles valiantly on the frozen tundra of Mann’s Planet, the motivated father somehow manages to crawl across a patch of icy firmament to retrieve his radio transmitter and call out to Amelia and TARS for rescue with their ship. Arriving quickly, the trio then head out to space towards the Endurance where Mann is attempting to dock. On Earth, while passing droves of families desperately fleeing their dust-covered towns in search of greener pastures on her return to the NASA research facility, Murph suddenly turns around and makes her way back to the farm. Without bothering to convince Tom to change his mind, Murph stops first in the middle of his corn fields to ignite a flame. Cooper’s daughter, the light-bearer, frees her brother and his family from their death sentence by giving Tom no choice but to flee the farm and leave with her. The moment precisely at the height of Mann’s self-righteous arrogance, the airlock blows – obliterating Mann’s ship, setting the Endurance into a tailspin, hurling the ship down towards the icy world below, and flinging debris into the space surrounding. The event puts a look of disbelief, despair, and hopelessness on the faces of Amelia and Cooper as they witness the scene from afar. Time, a most precious resource, appears to be slipping away from Cooper. What follows, however, is a quintessential display of the unbreakable human spirit as Cooper – against all odds – pilots the ship towards the crashing Endurance and successfully docks. The scene shows mankind’s capacity and will to act against logic and reason to achieve greatness, driven instead by love. Once aboard the Endurance, Cooper, Amelia, and TARS make their separate ways to the remaining docked ships to propel them towards Gargantua to use its gravitational pull as a slingshot. With barely the resources to make it to either Edmunds’ Planet or back to Earth, Cooper elects to help Amelia reach her loved one’s world. To reduce the weight load on the Endurance, Cooper decides to eject the ship TARS is operating into the black hole once its fuel has been fully depleted. Against Amelia’s protests, Cooper then ejects his own ship into the center of the collapsed star in the hopes that he may be able to transmit data from the black hole back to Earth and allow Murph to solve Dr. Brand’s physics problem. With Amelia’s safe passage to Edmunds’ Planet secured, Cooper enters the singularity – transcending to a higher dimension. The trained engineer and his robotic companion are then somehow placed in a constructed tesseract, the fourth dimensional representation of a fifth dimensional space. The duo quickly realizes that the tesseract is a link to Murph’s bedroom unbound by time. While he is unable to directly speak with his daughter, nor take a physical shape within her room, Cooper is able to communicate with Murph through manipulating gravity. The once skepical father has awoken – his initiation has begun. Cooper floats around the tesseract witnessing various moments from Murph’s life, including his gut-wrenching goodbye, which he responds to in retrospect with painful screaming and pleading with his past self to “stay” as he pounds against the back of Murph’s bookshelf – knocking the “s”, “t”, “a”, and “y” titled books onto the floor. Amid Cooper’s growing feeling of despair that he has been placed in a hopeless dungeon – sentenced to spend his remaining days observing his mistakes over and over ad infinitum – there is a moment of clarity. And in that moment, Cooper resolves to have TARS analyze the tesseract and transcribe his findings about gravity in binary code so that he may transmit them to Murph through 0s and 1s on the ticking hands of the wristwatch he left her. Meanwhile, Cooper goes to the moment during the dust storm when Murph left her bedroom window open and distorts gravity around the falling dust particles so that they form coordinates to the NASA facility. With Tom’s family safely waiting within Murph’s vehicle ready to leave the farm, the sentimental daughter, led by an unwavering yearning, goes up to her former bedroom in search of an answer for her mysterious childhood “ghost”. The enlightened scientist seeks, and she finds the clue in the strange ticking of her father’s old watch. Cooper: Don’t you get it yet, TARS? I brought myself here! We’re here to communicate with the three-dimensional world! We’re the bridge! I thought they chose me. But they didn’t choose me, they chose her! Cooper: To save the world! All of this, is one little girl’s bedroom, every moment! It’s infinitely complex! They have access to infinite time and space, but they’re not bound by anything! They can’t find a specific place in time, they can’t communicate. That’s why I’m here. I’m gonna find a way to tell Murph, just like I found this moment. Cooper: Love, TARS, love. It’s just like Brand said. My connection with Murph, it is quantifiable. It’s the key! Cooper: Find how to tell her… The watch… The watch. That’s it. We code the data into the movement of the second hand. TARS, translate the data into Morse and feed it to me. Murph: [rushing downstairs to Tom’s family with the watch] He came back! It was him! All this time, I didn’t, I didn’t know it was him! Dad’s gonna save us! Upon his brilliant daughter’s discovery, the tesseract closes around Cooper; transporting him to the wormhole near Saturn in the process. The astronaut, having been picked up by a space transport and transferred to a hospital, awakens to familiar sights and sounds – kids playing baseball outside, a heart monitor beeping, and medical doctors’ updating Cooper on his vital signs. Apparently, since leaving Mann’s Planet another 67 years has passed (Earth-time) as a result of time dilating when the Endurance was slipping towards Gargantua, Cooper was passing through the black hole, and floating around the tesseract. In that time, Murph was able to use the data transmitted by Cooper to solve Dr. Brand’s problem correctly. Upon rising from his hospital bed, Cooper notices something strange about his surroundings. A look out the window reveals a lush cylindrical space station teaming with life. The station, named after Murph and presumably one of many filled with Earth’s human population, is drifting near the wormhole awaiting an affirmative message from beyond. Cooper is notified that, upon his discovery near Saturn, Murph was awoken from her cryosleep. The father is led to his daughter’s hospital room, ushered past a large group of a dozen or so family members at her bedside, and reintroduced to a now 100 year old Murph. With his daughter’s urging, Cooper heads to Edmunds’ Planet where Amelia has set up a colony, buried Wolf Edmunds body, and remains unaware that Murph succeeded in transporting Earth’s space stations to the wormhole in preparation for inhabiting Brand’s new planet. If a tree falls in the forest, but nothing is around to hear it, does it make a sound? If the Universe exists, but no being is around that can perceive it, does life have meaning? Perhaps our bodies are merely temporary vessels formed through a long evolutionary process that we inhabit on loan for the purpose of marveling at the Universe’s creation, perceiving it, and studying it until with can understand a higher truth. Evolution, the process of bequeathing life to successive generations, may be the means by which the Universe forms a being worthy of inheriting a stewardship role for life. If we pass down our DNA, experiences, and wisdom to proceeding generations we might be able to build our species’ collective knowledge over time to eventually transcend above our current place in the cosmos. For now though it seems we have been placed in the forest to search for meaning in the sights and sounds around us. In many ways, I see Interstellar as a response to a growing tendency for people, Generation Y Millennial Americans in particular, to be at risk for supporting the kind of flying-too-close-to-the-sun macro-amorality to which Dr. Brand subscribes, and the head-in-the-dirt micro-amorality exhibited by Cooper’s son, Tom. There seems to be an increasing number of people capable of caring deeply about the devastating implications of things like climate change, or microaggressions in North America, where the most privileged lifestyles in the history of the world exist. And while these are two valid concerns worthy of our best efforts to address, it seems arrogant to think that we will be the heroes of those stories, especially given that in many ways we are not even laying the groundwork for those who will be. As individuals, must our open, absorbing childhood wonderment necessarily give way to jaded, entrenched adulthood cynicism? In the film, a kind of world peace has been “achieved” on Earth, but at the cost of a universal lack of ambition, lack of drive to strive for something greater than what previously existed. Creating something new requires the destruction of something else, and that demands friction and conflict. Not that war is good and peace is bad, but that conflict is necessary for change, and sometimes peace and calmness can mean stagnation – leading to decline. Equilibrium is achieved through an active balancing process filled with conflict and compromise. I don’t think it’s a coincidence that the scientists sent in the Lazarus mission did not have families of their own, which in the case of Dr. Mann leads to his selfish action of tricking the Endurance mission into rescuing him. Mann was right about the survival instinct extending to one’s children, and that may be the deciding factor that explains his selfish cowardice compared to Cooper’s heroic willingness to think outside of his own immediate needs and sacrifice himself for his daughter’s future. There are limits to an individual’s moral compass, but those limits can be expanded and strengthened through one’s children, family, and other close relationships. As exemplified by Mann, loneliness, isolation, and anti-socialization has the power to corrupt. To Dr. Mann’s point, our bodies keep us alive through involuntary biological mechanisms – hunger and thirst cues, a beating heart, self-healing tissue, releases of adrenaline or dopamine, etc. – without our conscious minds controlling them or even being aware of them. In a way, we are unconsciously seeking immortality through our survival instinct. But we are also capable of purposefully seeking another type of immortality, one that is perhaps more noble, which is achieved through procreation – passing one’s genes on to a subsequent generation. One’s existence can be extended further still into the future by imparting knowledge, experiences, wisdom, love, devotion, and dedication to one’s children. And not only so that a positive image will live on through other’s memories in the form of a legacy, but so that one’s children are better, more well-rounded, and experienced people who are more likely to do the same and continue a life cycle that fights processes of decline. Not to say that selflessness is entirely possible; people will tend to do what makes them feel good. But so long as we remain aware of the fact that we do things because they make us feel good about ourselves, we may be able to get closer to doing what is right – what one ought to do. That requires going against our programming, against our survival instincts, and making sacrifices to our immediate desires for the benefit of long-term goals. One way to look at the human life span is that our individual lives are so short that we want to experience all that we can and things like careers, responsibilities, and even children can get in the way of living out our potential. From another point of view, however, human lives are so short that to render any meaning from the relatively small amount of time we exist, we must reach into the following generations through impactful work, raising children, and imparting valuable lessons. Interstellar’s final scenes, aided by the orchestral swell of Hans Zimmer’s inspiring score, succinctly summarize the lesson to be gained from the film’s allegorical story. In the plot, Cooper travels through a wormhole to another dimension then is brought back to his reality where he is ultimately rescued and given a chance for redemption with his daughter. In the plot’s story, Cooper “dies”, but his passed down wisdom “lives” on in a new form through his daughter. If he hadn’t passed his knowledge down, he wouldn’t have been able to “come back to life”. In the last scene, both characters get closure. Cooper sees that his sacrifice was not made in vain. He has achieved the best one can hope to in one’s lifetime – his striving and sacrifice has created something beyond himself, Murph, which is better than him and will outlive him. Murph has succeeded in not only saving mankind, but fostering the type of close-knit family that is crowded into her hospital room in her final moments. She has surpassed Cooper with the help of his striving, passing of knowledge, love, and sacrifice. However, Cooper’s resurrection was not guaranteed; he almost gets so caught up in his own pursuit to save mankind at the bequest of Dr. Brand that Cooper initially abandons his parental responsibilities. Still, the pioneering father is able to redeem himself ironically thanks in part to the lesson necessarily delivered by the Fallen Angel in Hell. By sacrificing himself and transmitting data – or passing down his wisdom – to Murph who is then able to use the information to “save the day” and rightfully become the true hero of the story, Cooper redeems his earlier failure. Murph, representing the next generation, rages against the dying of the light – fighting to prevent the loss of knowledge. Neither putting one’s head in the sand like Murph’s brother and just worrying about immediate needs while overlooking his family’s long-term health, nor seeing only the distant future like Dr. Brand while ignoring the current generation can be the right, ethical answer. The moral thing to do is what Cooper does – strive towards a better future to the limits of his ability without forgoing his responsibilities and leaving behind the next generation. The Nolan brothers’ message to their audience is to never stop striving towards a better future, but also not to abandon immediate responsibilities to those around us. Learn, acquire knowledge, grow as a person, and then pass that wisdom on to the next generation so that they may surpass what came before and continue an upward cycle that fights entropy – the natural tendency towards disorder over time. Interstellar promotes striking a balance between large-scale, macro thinking about humanity and the individual, micro needs of those immediately around us. Cooper almost allows his macro ideals to get in the way of his micro responsibilities but by the end of the movie is able to achieve both by exerting himself for the benefit of the future, letting his life go, and imparting his knowledge to the next generation. Not only does this recipe lead to the saving of Earth’s human population in the movie, but to generally good outcomes that serve as a template for people to follow in their daily lives. The dying soil in Interstellar‘s near-future Earth setting is analogous to any entropic problem that people face throughout their lives. The Endurance‘s perilous intergalactic mission represents the struggles one encounters while trying to confront any issue. The story’s message is the filmmaker’s idea for how one ought to act in order to achieve a desirable outcome. In my opinion, this movie combines captivating characters, heartfelt relationships, gorgeous cinematography, and clever screenwriting to create a nearly flawless artistic masterpiece supported by a solid moral footing. Perhaps Dr. Brand, a Generation Y Millennial, is correct, but only if we remain complacent, ignorant, and if we covet the role of the hero without the willingness to make sacrifices. He is not, however, necessarily correct. If we can raise our eyes above the horizon and dream among the stars, if we can use our short life spans to strive for something beyond our current circumstances, and if we can pass our acquired knowledge on to the next generation so that they may surpass us, then we may find all the help we need. Only through the hero’s journey, an odyssey, can we discover the knowledge that is to be handed down upon the hero’s return. Interstellar‘s message is revealed early on in the film during a dialogue between Cooper and Brand, which I quoted near the beginning of the article (reprinted below with added emphasis and comments). Dr. Brand: We’re not meant to save the world. We’re meant to leave it (to our children). Cooper: An hour ago, you didn’t even know I was alive and you were going anyway. “Something” sent Cooper to the NASA facility. Murph’s ghost, which we learn is Cooper gifted with foresight by the fifth dimensional beings who placed the wormhole near Saturn and constructed the tesseract, represents the motivating force that wills our thoughts into actions. Our best intentions; our future self that each of us strives to become – achievable only through sacrifice. While I see this film as promoting the importance for people to play a parental role to inspire future generations of children so that we, as a species, may one day set into motion a process of continual transcendence wherein entropy is overcome, I acknowledge that I am likely projecting some of my own personal views of parenthood, child-rearing, and social responsibility onto a film, which contains many themes related to a variety of topics including family, legacy, and sacrifice. However, with my interpretation of this film and my own related thinking about parenthood, I in no way mean to imply that people who are unable to conceive children, or people who choose not to have children are problematic for society. Many times, being an involved aunt or uncle, community leader, or adopter fulfill those same social roles that I believe Interstellar promotes in its message. There are many avenues capable of leading to the same goal. Therefore, so long as people strive to play a role in promoting human advancement, whether as a biological parent, a legal guardian, or a community role model, the outcome of a stronger society is most important, regardless of the means by which it is achieved.